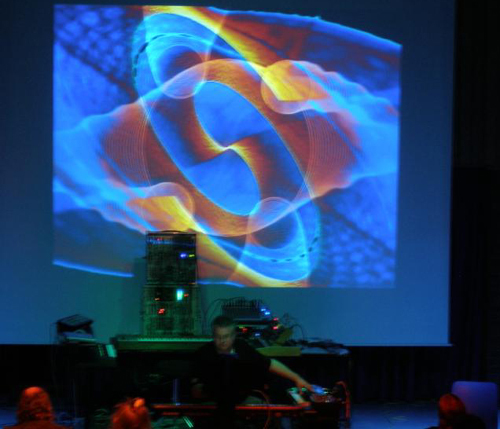 April 2011 Peter Challoner and Spiraleye performed their new albums Optimum and Ramelion at Awakenings with Ian Boddy headlining. Information on both albums has been added to the music page. 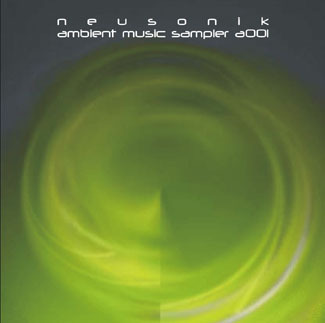 July 2010 New CDs released, Indefinite Duration – new ambient album; and Ambient Archive – double album of previously unreleased tracks. 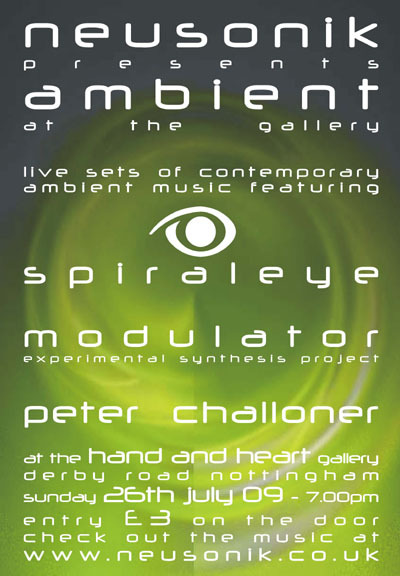 July 2009 Neusonik promotes 'ambient at the gallery' live music event at The Hand & Heart Gallery, Derby Road, Nottingham on Sunday 27th July 2009, featuring Spiraleye, Modulator ESP and Peter Challoner, entry only £3, doors from 7pm, and releases new ambient music sampler, neusonik.001a featuring the acts who are performing, this is available to download free from the Neusonik samples page. 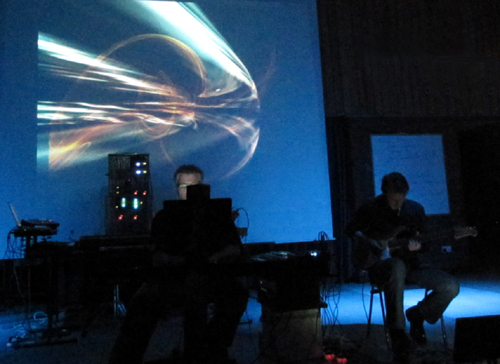 February 2009 New ambient album 'deconstructing silence' to be released this month. 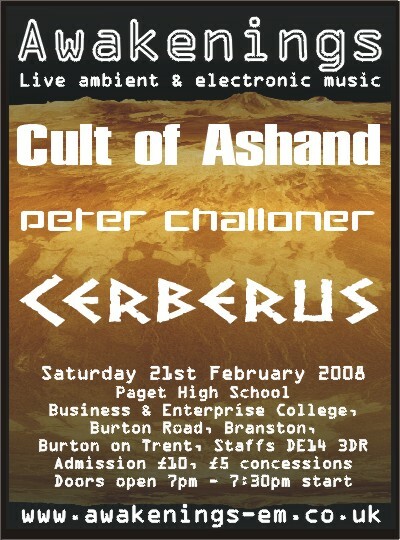 To coincide with the new release, Peter will be performing his first ever solo live set at the Awakenings event in Burton on Trent on Saturday 21st February 09 (http://www.awakenings-em.co.uk/) The set will include elements from the new ambient album plus some rhythmic and sequencer elements too. 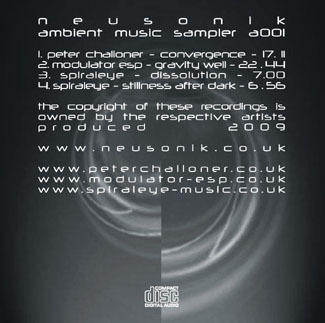 September 2008: The first album from Spiraleye. Spiraleye (www.spiraleye-music.co.uk) is a collaboration between Pete and guitarist Neale Haddon and their debut album, The Space Between is now available. To mark the launch, Spiraleye will be performing some of the tracks from the album at the Awakenings on 25th October. September 2008: New album Lunar Tide released. 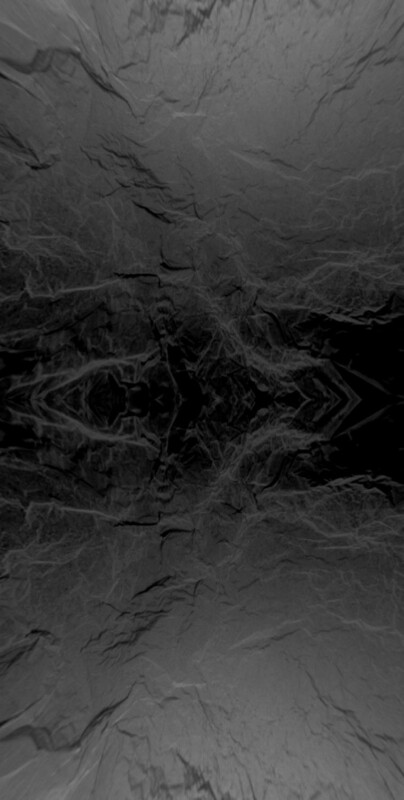 A 60 minute soundscape of ambient space music. Lunar Tide is available as a free mp3 download including artwork by clicking here. June 2007: The site Guestbook is now open. Thanks to everyone so far who has checked out peterchalloner.co.uk, I hope you like the site and the music. If anyone would like to post a message, it would be great to hear what you think, Pete. June 2007: Reviews of 'Interpolation' and 'Beneath The Ice Flow' by Bert Strolenberg have been added to the reviews page. April 2007: New Album 'Beneath The Ice Flow' released. Ambient music with a darker side. 'Beneath The Ice Flow' captures a sense of darkness and depth while revealing a dramatic, but rarely seen landscape, imagined through sound. Listen to samples on the music page. March 2007: New album ‘Interpolation’ is released. Interpolation takes the idea of the ambient soundscape type of track as a backdrop and adds sequences and rhythms from the more uptempo type of EM/synthesizer album and brings the two together. The result being an ‘interpolation’ between the two, while staying on the ambient side. The tracks were recorded at various times during 2005 and 2006 and in several different ways, including some ‘live’ studio takes. The title track 'Interpolation' is also included on the Awakenings 2007 volume 1.5 compilation from AmbientLive. Listen to samples on the music page.